Hi there! Tarah from What I Gather, back with another garden fresh recipe for you! This dish absolutely screams summer – a light fish seasoned with the bright flavors of dill and lemon, accompanied by squash and tomatoes. No, you can’t grow Mahi Mahi in your backyard, but a lot of us do have zucchini, crookneck squash and juicy, red tomatoes. 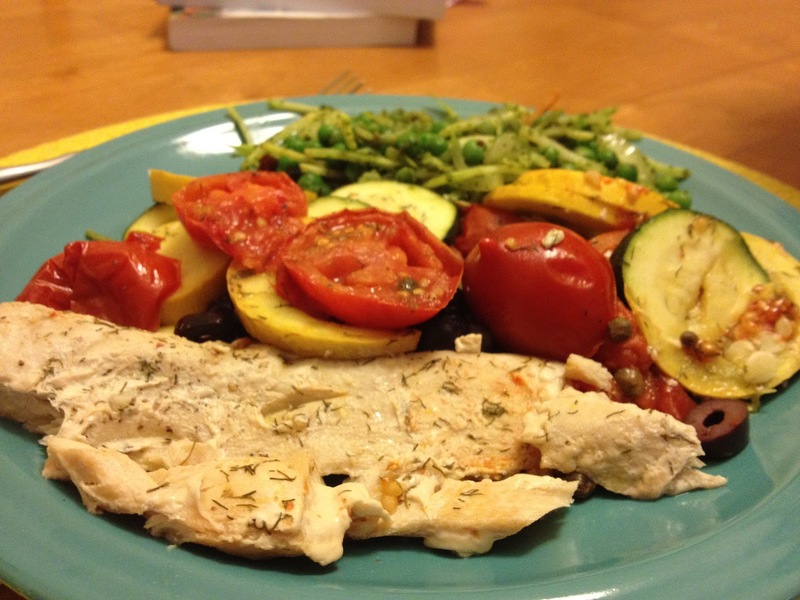 This Summer Vegetable Mahi Mahi Bake is a delicious way to utilize your summer bounty. Place zucchini, crookneck squash and tomato slices into a large bowl with the minced garlic. Drizzle with olive oil and juice of half of a lemon. Season with dill, salt and pepper. Stir well to evenly coat vegetables. Line a large baking dish (about 8”x12”) with foil. Place Mahi Mahi filets in bottom of pan. Drizzle olive oil and lemon juice over fish filets. Season with salt, pepper and remaining dill. Pour seasoned vegetables into the pan, evenly covering fish filets. Place thyme sprigs on top of vegetables. Cover baking dish with foil and place in oven to roast for 25 minutes. After 30 minutes, remove foil from pan. Remove thyme sprigs and sprinkle olives and capers evenly over vegetables. Return to oven to cook, uncovered for an additional 5 minutes. Check to ensure fish is cooked through and vegetables are soft. If necessary, continue to cook at 5 minute intervals until done.